February 18, 1945 -- It is announced that the Chicago Title and Trust company has finally, after a 54-year buying program, gained control of the largest single piece of privately owned property in the Loop since 1897. The firm originally intended to locate its offices in a new building on the site at the corner of Washington Street and Dearborn, but opted instead to purchase the Conway Building ablock west and sell the large corner block next to the First United Methodist Church of Chicago for a development deemed "proper for such a big and strategic location." 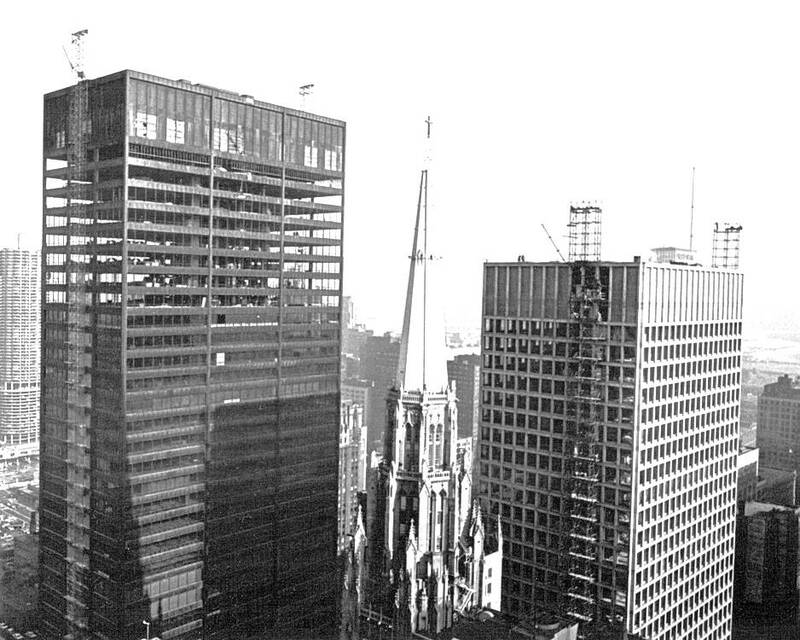 Ultimately, the Brunswick Corporation purchased the property, and in 1965 the SOM-designed headquarters for Brunswick was completed, at the time the tallest reinforced concrete structure in the world. The photo above shows the Brunswick Building (now offices for Cook County) under construction across the street from the Daley Center, completed in the same year. The spire of the First United Methodist Church of Chicago separates government from the private sector.